'World of Dance' Qualifier Victoria Caban. Photo by Justin Lubin/NBC. After an intense first round filled with great talent from all over the world, the last round of World of Dance‘s Qualifiers Round was certainly one to remember as more amazing dancers took the stage to get one step closer to the $1 million prize. Victoria Caban was first to hit the World of Dance stage. She brought life to the stage a something never seen before as she performed a Flamenco routine in hopes of wowing the judges. Victoria expressed her inner ferocious tiger from the moment she walked on stage. The electricity of this Flamenco routine coursed from her facial expressions and right down to her feet. Victoria showed the maturity and grace of a woman with her smooth transitions and lines. With a mixture of contemporary weaved in throughout her routine, she brought light to the artform of Flamenco dance and created a masterpiece of her own. According to Derek Hough, Victoria was the “Misty Copeland of Flamenco”, and her scores from the judges proved that to be true. With a score of 90.7, Victoria secured her spot in the Duels. ‘World of Dance’ Qualifiers Pursuit. Photo by Trae Patton/NBC. Next to grace the World of Dance stage was Pursuit. Competing with a contemporary routine, Pursuit was a work of art as they created beautiful pictures with their bodies. Their musicality was exceptional as they matched the music’s slow build up with smooth yet poppy movements. They brought a different feel to the contemporary style with a sprinkle of hip hop. Pursuit also incorporated counter rhythms within the space of the music, which made for performance magic on the stage. Along with some amazing synchronicity, Pursuit sparked the judge’s interest in seeing more, and they will move on to the Duel round to go head-to-head with more amazing talent. ‘World of Dance’ Qualifiers L&J. Photo by Justin Lubin/NBC. Another performance that made waves on the World of Dance stage was a contemporary routine performed by L&J. This dynamic duo’s passion was evident even as they just stood on stage together before the music started. This passion flowed straight into their movement as they moved from one element to the next. L&J had chemistry that was out of this world and it showed not only in their movement but in their facial expressions, which as topped off perfectly with their music choice. They danced like a real-life couple and brought the judges and audience into the story of their routine with partnering work that was athletic and executed gracefully. L&J certainly piqued the interest of the judges, and after receiving rave reviews and a score of 90.3, they will get to showcase even more of the passion that they share in the Duels. ‘World of Dance’ Qualifiers The Pulse. Photo by Justin Lubin/NBC. The Pulse brought some more great energy to the stage with a ballroom routine. Coming from one of the best studios in the country and the same one that Derek Hough trained at, the pressure was on for The Pulse to deliver a performance that the judges would love. Their movement was fun and full of energy right out of the gate with great music to top it off. There was one element where they did a shadow movement where everyone was connected and made one big partnering line. This was a nice creative touch to The Pulse’s routine and one that made for a great visual effect. Their partnering work was exceptional, and they were explosive on the stage. Although they delivered a fun and energy-filled performance, The Pulse just scraped by with a score of 80.3 and were challenged to relax in their movement and bring even more in the Duels. ‘World of Dance’ Qualifiers Avery and Marcus. Photo by Trae Patton/NBC. Bringing a fusion of contemporary and ballet to the stage was Avery and Marcus. As the only pointe routine in the competition, Avery and Marcus brought a different vibe to ballet that had never been seen before on the World of Dance stage. Their partnering was fluid yet hard-hitting and had a bit of edge to it as well. The strong technique and performance quality in their routine was phenomenal, and with energy that stayed on 100 percent throughout their performance, Avery and Marcus secured a spot in the Duels, scoring an 84.0. Another highlight of the performances that hit the World of Dance stage was The Funkywunks. This hip hop crew was chalked full of personality from the moment that they stepped out on stage. The Funkywunks brought flare to their style of hip hop dancing by mixing vogueing, twerking, krumping and anything else imaginable to create an amazing routine. They were comical and kept the entertainment up from start to finish. Not only did The Funkywunks serve amazing stunts but also great transitions and visuals that kept the judge’s and audience’s attention. They had a great start to their routine and continued to build from there. 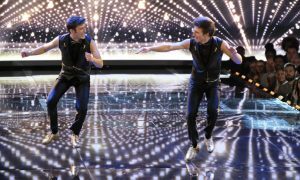 The Funkywunks made their mark on the World of Dance stage, and with a score of 87.0, they will get to continue to make their name known in the Duels round. ‘World of Dance’ Qualifiers Morning of Owl. Photo by Trae Patton/NBC. There were many great performances that followed The Funkywunks, and these groups wowed the judges as well, earning them a spot in the Duels and putting them closer to the ultimate prize. Closing out the night and finishing the Qualifier round on a high note was Morning of Owl, a street fusion trio. There was a martial arts quality to their movement early on in the routine but mixed in throughout. They kept the audience and judges engaged with their smooth transitions and movements, all while combining a mixture of styles together to make up their own unique dance style. Morning of Owls incorporated some amazing partnering tricks matched with flawless execution that left the judges in awe. With a score of 84.0, Morning of Owl secured their spot in the Duels to go head-to-head with many other great talents. With the Qualifiers round officially done, the competition will continue to heat up as the highest scoring groups get to pick who will go head-to-head with in the Duels in hopes of securing a win and moving on to the Cuts. Tune in to see who will make it through to the Cuts as World of Dance continues to heat up. You don’t want to miss it!